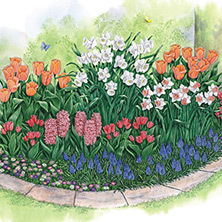 Foundation Planting - You should plant Bulbs in a grouping of twelve or more bulbs to add colour in the early spring to a foundation planting. Evergreen shrubs planted in the foundation planting will provide a nice background for the bulbs. 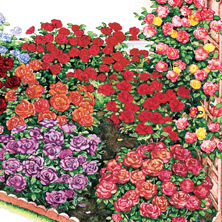 Pay attention to the foliage colour of annuals and perennials, as they too will become a backdrop for your bulbs. Deciduous Shrubs and Trees - Spring Flowering Bulbs can be planted under deciduous shrubs or small Trees in the landscape. However, you should not plant Spring Bulbs under evergreen shrubs or they will not have enough light to grow and bloom. Early blooming bulbs receive plenty of light because they start growing long before deciduous trees and shrubs start to develop leaves. 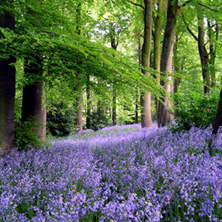 Some bulbs that perform well under trees and shrubs include: grape Hyacinths, Crocus, winter aconites, Snowdrops, bluebells and early maturing Daffodils. By carefully selecting Spring Bulbs to match blooming dates with the bloom of the shrub, they can provide a beautiful colour contrast with early flowering shrubs such as forsythia or flowering quince. They can also be used in combination with smaller flowering trees like Crabapple, Bradford Pear or Redbud. Border Planting - A border of low growing bulbs such as grape hyacinths, Hyacinths or small Daffodils planted around the edge of a vegetable garden or flower bed adds interest to these areas. A border of bulbs planted along the edge of the lawn will add a splash of colour to the lawn area. Perennial Beds & Rock Gardens - Spring Bulbs can be designed into a perennial bed or border to add areas of spring colour. The bulbs will bloom during March, April and May before perennials start to flower. Locate the bulbs in the flower bed so that the dying foliage will be hidden when the perennials start to come in. 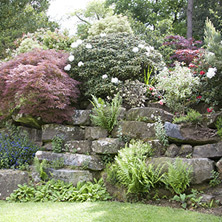 When planning borders, it is essential to take into consideration the heights and spacing needed by different plants for a visually pleasing effect. Ground Cover - Some bulbs can be planted with low growing ground covers like ajuga, violets, vinca minor or English Ivy. 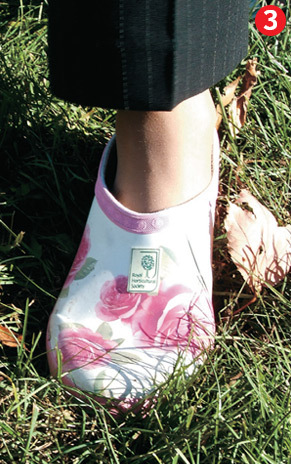 Just be sure to keep in mind the height relationship between the ground cover and bulb flower. As a general rule, the ground cover should be no more than half the height of the bulb flower. 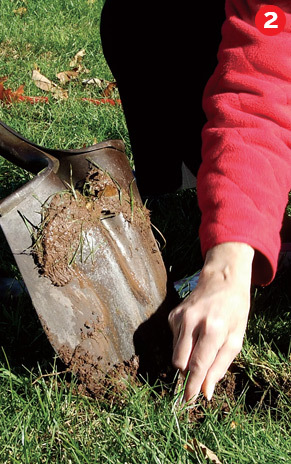 Lawn Area - The corner of the lawn is a great place to develop a new flower bed. These beds are often composed of small shrubs and perennials. 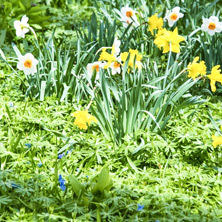 One or two groupings of Spring Bulbs of one colour located in the flower bed will provide a point of focus during the spring months. Two great bulbs for this area are Snowdrops and Crocus. 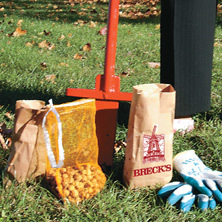 You can plant these under trees and shrubs or scatter them freely over the lawn. These are the first blooms to appear after a long dreary winter. Plant early flowering bulbs in your lawn with 3 easy steps. 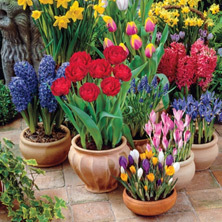 Containers - Both spring and summer bulbs can be planted in portable containers. If spring bulbs are planted, the container can be moved to a location out of sight while the foliage matures, once the bloom time is past. If summer bulbs are used, they will add colour all summer long to areas such as a patio or a deck. Containers are portable and they can be moved around and used in different areas of the landscape. When relocating a container in the landscape, pay attention to the light requirements of the bulbs and be sure the container has drainage holes. 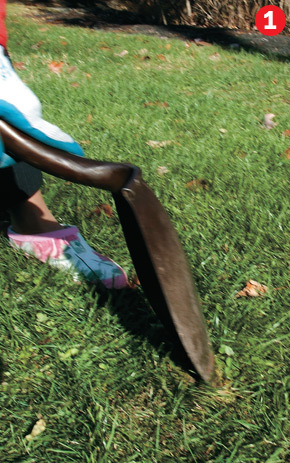 Steep Slopes - Steep slopes in the landscape are difficult to mow and maintain. 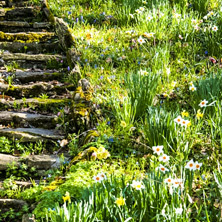 Many gardeners are now using Daffodils on these steep slopes to add early spring colour to the landscape. Another effective option is to use the perennial, daylily, which has a fiberous root system. The foliage is attractive and the bloom adds colour to the area. By using Daylilies, you eliminate the problem of trying to mow that area of the landscape.